CLEVELAND — Another day and still no official word from the Cleveland Browns on the hiring of head coach Freddie Kitchens, but reportedly, the organization has been focused on building up the coaching staff. On Friday evening, the NFL Network's Ian Rapoport reported that the Browns are working on a deal to make former Arizona Cardinals head coach Steve Wilks their defensive coordinator. Wilks has nearly 20 years of coaching experience at the collegiate and professional ranks. Prior to his one year as head coach of the Cardinals, Wilks held the defensive backs coach position for the Chicago Bears (2006-2008), San Diego Chargers (2009-2011) and Carolina Panthers (2012-2014). Wilks added assistant head coach to his defensive backs duties with the Panthers in 2015 and 2016. Then, for the 2017 season, Wilks retained the title of assistant head coach while being elevated to defensive coordinator. Prior to his NFL career, Wilks coached collegiately at Johnson C. Smith University (1995-1996), Savannah State (1997-1999), Illinois State (2000), Appalachian State (2001), East Tennessee State (2002), Bowling Green State University (2003), the University of Notre Dame (2004) and Washington (2005). 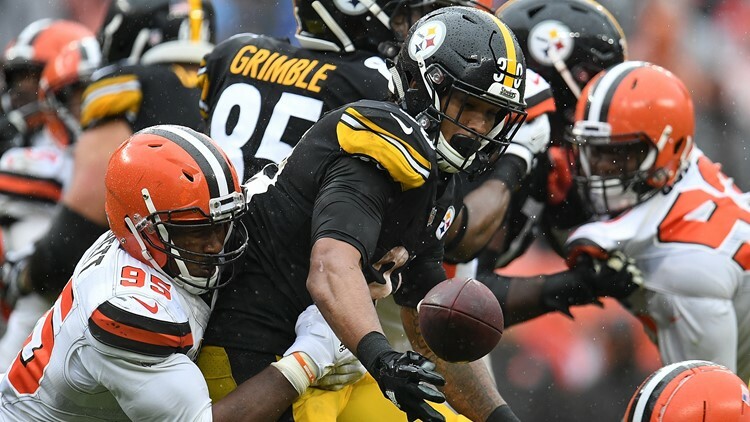 Cleveland Browns defensive end Myles Garrett forces a fumble from Pittsburgh Steelers running back James Conner (30) during the fourth quarter at FirstEnergy Stadium in Cleveland, Ohio on September 9, 2018. Should the 49-year old Wilks, a native of Charlotte, North Carolina, be hired as defensive coordinator, he will take over a side of the ball that will be well represented at the Pro Bowl later this month. Second-year standout Myles Garrett became the first Browns defensive end to make the Pro Bowl since Rob Burnett in 1995, while cornerback Denzel Ward was the franchise’s sixth rookie selected for the postseason honor. Fully healthy coming into his second NFL season, Garrett emerged as a leader for the Browns’ defense and registered 44 total tackles, including 35 solo stops, while playing in all 16 games for the team who selected him with the No. 1 overall pick in the 2017 NFL Draft. Of those 44 tackles, 13.5 were sacks on opposing quarterbacks for 75.5 lost yards. With 20.5 sacks, Garrett registered the most by a Brown in the first 27 games of a career, as well as the most by a Cleveland defender in his first two professional seasons. This season, Garrett ranked sixth in the NFL with the 13.5 sacks and fourth in the AFC with four forced fumbles. Garrett was the Browns’ first front seven defender to reach All-Pro status since linebacker Jamir Miller in 2001 and first defensive lineman since Michael Dean Perry made the AP All-Pro Team in 1994. 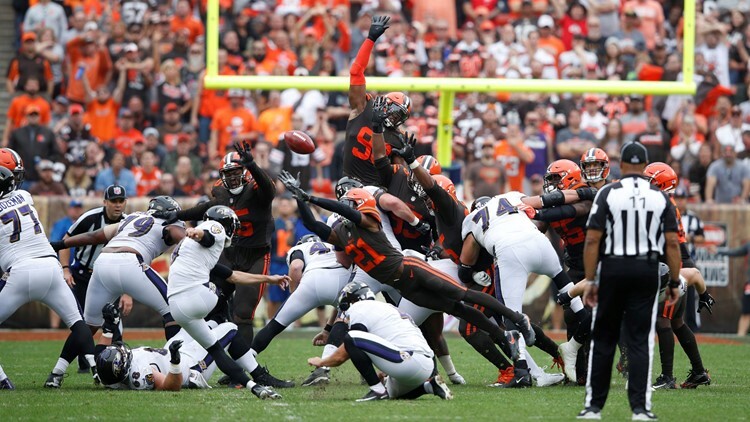 Cleveland Browns cornerback Denzel Ward (21) blocks a field goal in the second quarter against the Baltimore Ravens at FirstEnergy Stadium in Cleveland, Ohio on October 7, 2018. A two-time Pepsi Rookie of the Week (Weeks 1 and 5) and one-time AFC Special Teams Player of the Week (Week 5) honoree, Ward is among the AFC leaders with three interceptions. The No. 4 overall pick of the Browns in the 2018 NFL Draft out of The Ohio State University, Ward ranked tied for second in interceptions and passes defended, tied for third in forced fumbles and tied for first with two fumble recoveries among first-year players. In his 13 games with the Browns this season, Ward registered 53 total tackles, 41 solo stops and 12 assists along with three interceptions, which he returned for 26 yards, 14 passes defended, one forced fumble and two recoveries.